The ferry left Koh Phi Phi pier at 09:00 am, as scheduled. The boat is different from the one I took from Phuket to Koh Phi Phi. It’s a bit smaller, not much space between the seat, not really comfortable to sleep there. This joint ticket is part of Chao Koh group travel. It was a long journey to Koh Phangan: an hour ferry ride to Krabi, few minutes ride by a big pick up truck, half an hour ride by a good enough bus, then few hours ride by a regular bus and last, an hour ride by Lomprayah speed boat . There were 2 stops at the agent place along the way. The first stop was near Krabi for about 15 minutes and the next one was in Surathani for more than an hour. Krabi and Surathani look like a small town, lots of red soil and trees along the road. It was so hot that it looked like a dry land. At Donsak pier Surathani, we took a Lomprayah speed boat, which is a Cataram, that is ofcourse much better and faster and the seat has more space for my legs. The ride is a bit bumpy inside, but you wont feel anything once you are up in the deck. You’ll feel fresh air breeze and get to watch sunset. The total journey was about 9 hours. It was a nice ride and I didn’t really feel tired. I arrived in Tong Sala pier, Koh Phangan around 6pm. Luckily I met my best friend from Japan in that Lomprayah boat so no need to find each other in the pier. I had had my hotel reservation in Haad Rin, an hour ride from Tong Sala by minivan which costs 100baht/person. This minivan car is much much better than taxi/tuktuk with Air-Con, Isuzu Elf type of car and somehow it is cheap. There were only my friend and I and a guy from Aussie in the minivan driven by a lady driver who was still willing to take us in that late hour. We arrived in Haad Rin around 7pm and welcomed by a friendly staff at Baan Talay guesthouse. I booked my room through Sawadee.com for a single Air Con room (600baht) for one nite only. My friend wanted to join me then, so I upgraded it to a bigger twin bedroom with Air-Con and hot water for extra 100baht/nite. The room is not so bad. Unfortunately, I didn’t take any picture of it. Too bad!! I extended my stay there for another 2 nites. Soon after we put our bags in the room, we went to have dinner in Little Home restaurant. I had Pad Thai and Singha beer. Actually I ordered a Thai tea but they didn’t have it. There is a little argument with the young lady waiter about Thai Tea. She said ‘no thai tea’ but her English was so terrible that I don’t understand it. So I asked again and again and she was mad and said something I know not nice in Thai. That is really not a pleasant service, not for my first nite there after such long journey. An older lady came to help with our order later on. Fuh.. I won’t bother coming back to that restaurant again after that. What a pity for such a nice food with a beautiful waiter but scary and rude one!! 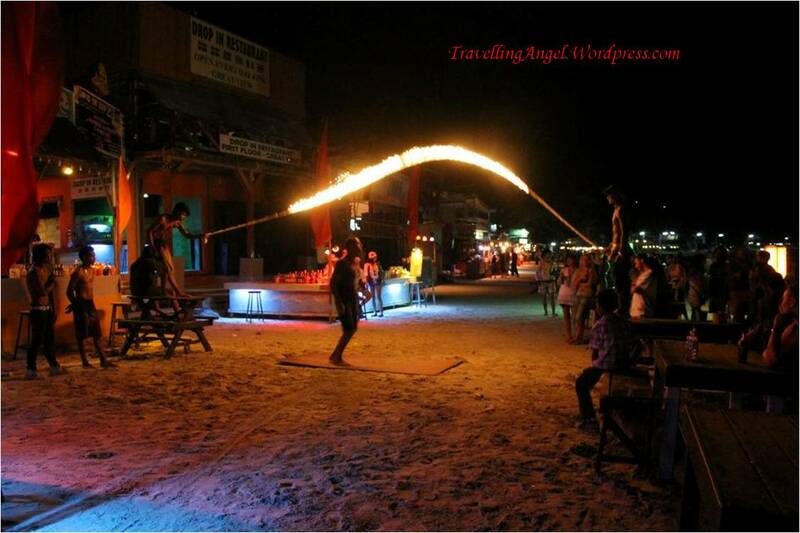 Later that nite, we spent some time on the beach, watching fire show at Cactus bar. Cool games!! 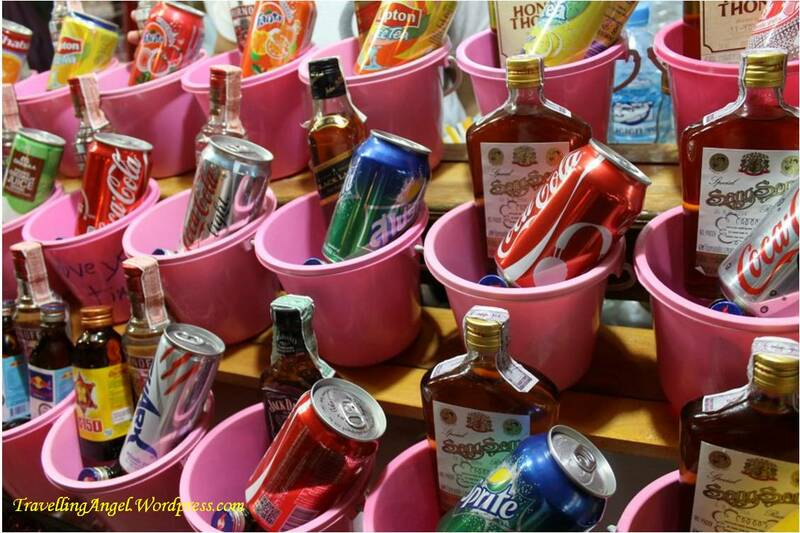 There were also vendors selling bucket drinks along the alley to cactus bar and on the beach. Our plan that day was either taking a tour or going to one of the most beautiful beaches in the island,Thong Nai Pan beach. We checked the transportation price with the hotel guy and he gave us a very high price of 1200baht/way for a taxi. Ow.. that’s crazily expensive. Then he offered 900baht/way but we should find the transport back on our own. Hm.. I don’t think I would do that. I read from other travelers’ blog that it would be difficult to find a transport to get out from Thong Nai Pan. She made a call to the taxi driver then 5min later, a taxi/tuktuk came. Wow, that’s fast :p We bargained and got a nice offered of 1800 baht/return. It’s still expensive though but he waited for us for about 3 hours and looking at the distance and road condition, I think it’s worth it. It was about 45min ride to Thong Nai Pan beach from Haad Rin. The road are crazy, like riding a jet coaster, ups-and-down the hill with some roads are still under construction and very fast drive. Many small rocks here and there and dust everywhere. Thanks God it was a sunny day. I cannot imagine how it would be on rainy day. And is it worth it to take this expensive and long ride ? YES!!! The beach is beautiful!! 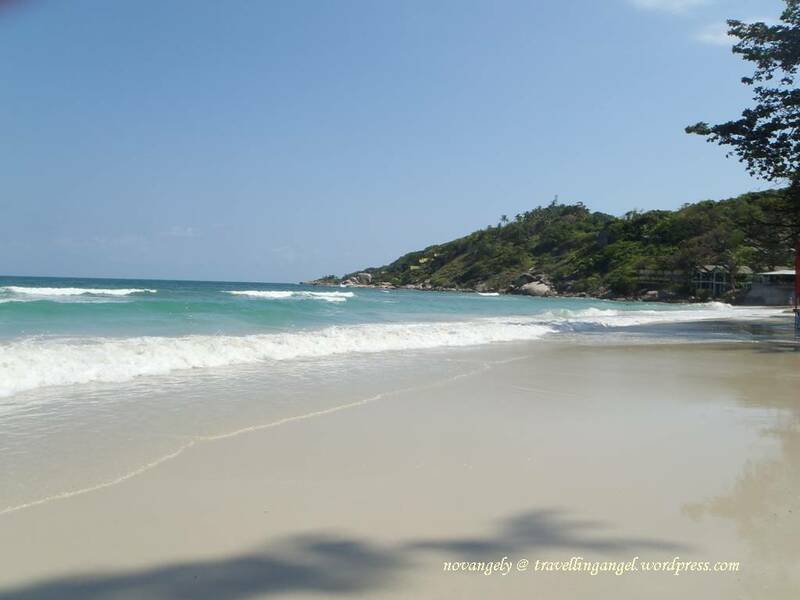 There are like two coves, Noi and Yai, both white sand beach. I went to Yai bay. It wasn’t too crowded or too quiet. The water is really calm and clear in emerald color… It has the same dept till about 10-15m from the beach so I can swim there. There are some cafes and hotels along the beach.. then the trees, coconut tree, and the hills as its landscape.. Oh.. it’s hard for me to explain it in words. I felt like in paradise. It was like having my own beach. I love it there and I would love to come back, even stay there for few days. I wish I could stay longer in that beach but we had to go back before dark. Again, we were like in a ‘roller-coaster’ ride to our hotel. The tuktuk taxi dropped us near our hotel and before going back, we check-out the Haad Rin beaches. It was late afternoon. The sunrise beach, where there is beach party at nite/fullmoon party, looks really nice. It is a long white sandy beach. There are people playing football or just hanging out on the beach. Meanwhile the sunset beach looks quiet. There are some big resorts but the beach is not as good as sunrise beach, mostly rocks and a small pier . At nite, we had dinner at Lazy House Restaurant. We were starving so we ordered many big meals that amazed the waiter. Ow.. that waiter was so friendly, we talked for a while. There is a movie played there every nite. It is a nice place to relax, enjoy your meal while watching new box office movie. All the foods tasted good. We ordered too much that we had to take some leftover back to hotel. Haad rin beach in daytime is like Kuta beach Bali but with a clear water. There is some wave but you can swim here. I was too tired so I didn’t swim there. Or maybe because I still have this image of people peeing there during nite party…. Then I remember I haven’t tried Thai massage so my friend and I went to look for a nice one and found Leela Massage near Lazy House guesthouse. I took an hour Thai massage and it felt good. I felt refresh. Then come again the nite but that time I met some friends from Couchsurfing at Mr. Corner restaurant. It’s a nice restaurant with a good mixed fruit shake. 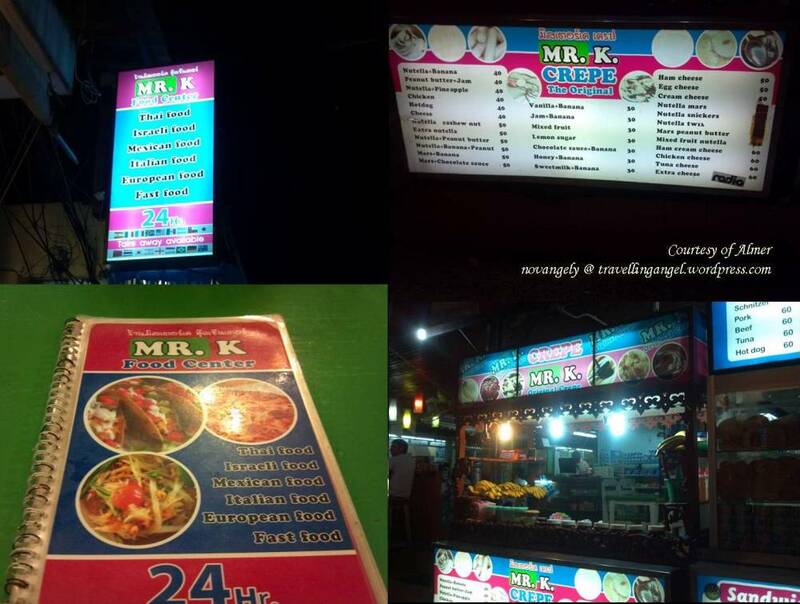 I think all restaurants in that corner have the same owner (Mr.K’s). Since I stayed out late and then packing, I only had 2 hours sleep. We had to catch our 9am ferry to Koh Samui in the morning. But we woke up around 8am, so it was like a rush hour. A quick makeup, grab our bags, tried to find the hotel staff for check-out and our deposit and then a quick walk to Haad Rin pier. It is only 5 min from the hotel but we were asked to come at 8.30am. We tried to be in time and walked in a hurry, while it’s actually okay to arrive 10min before ferry schedule. What a morning! !